Check out the previous posts in the series: A Work in Progress, Why it matters, and #nymwars! 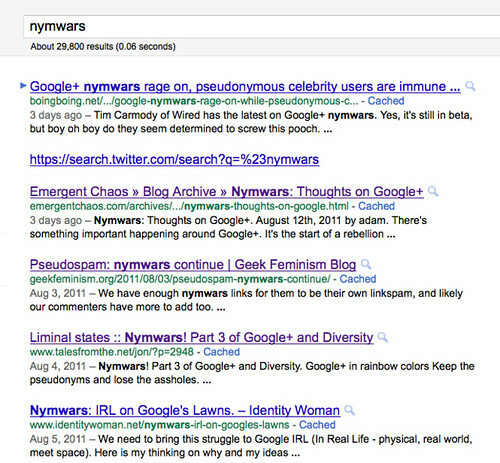 Here’s a good example of how Google+ is already influencing search results. 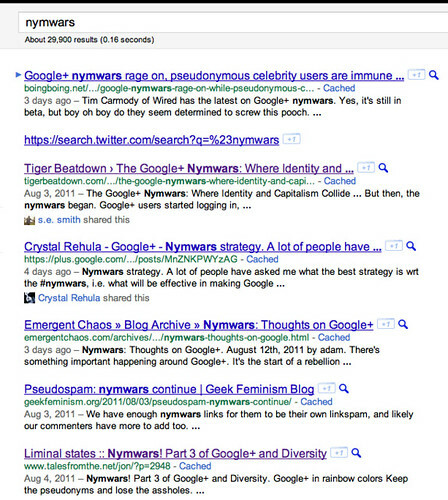 I’ve got screenshots below for two searches on nymwars, one when I’m logged into G+ and the other when I’m not logged in. Skud’s nymwars strategy discussion only shows up indirectly — the version reshared by Crystal Rehula. This is kind of weird, because Skud’s post has 123 shares, and I’m following her as well as Crystal. So it’s a great example of how Google+’s naming policy penalizes people like Skud whose names they don’t like. Sure you can read Skud elsewhere if you can find her. But what if she doesn’t show up in search? And it’s not just Skud. After looking at Geek Feminism’s Who is harmed by a real names policy? and My Name is Me, whenever somebody says something like “no reason G+ needs to be for everyone” what I hear is “no reason G+ needs to be for women, LGBTQs, people with disabilities, activists, whistleblowers, teachers, etc. etc.” Because, y’know, why would anybody want those people in our search results? It seems so obvious to me. I wonder why Robert, Joseph, Bradley, and Vic can’t see it? Update, August 18: in the excellent G+ discussion, Fedor Pikus discussed the various “signals” that feed into Google search, and highlighted that right now G+ is only a very small component. And sure enough, today s.e. smith’s post is high on the list whether or not I’m logged in. But Skud’s still rendered invisible. Posted by jon on Tuesday, August 16th, 2011, at 9:09 am, and filed under Professional. I’m surprised to see Scoble blithely assign somebody as well-known and highly-respected as Skud to the “won’t miss ’em” category. I’m also disturbed by subtleties in the verbiage — “unless she uses *A* common name”, as though “common” is an adjective meaning “acceptable” rather than what it really should mean, that is, HER common name, THE name that she is known by socially. As though there is some set of “common names” that are allowed, and she is unreasonably insisting on using a “non-common” name (even though it is, in fact, her common name by every definition they have so far offered). GWD, that’s probably got something to do with it. Have you ever read Guys Don’t Link? Joe T., Skud’s very well known in the open source and Geek Feminism communities, but my guess is that Robert doesn’t spend a lot of time in either of those. detail from Robert Scoble’s “Tech Bloggers” circle on Google. Robert’s emerged as one of the very few bloggers defending Google’s naming policy. I ended A tale of two searches with a rhetorical question about why why Robert, Joseph, Bradley, and Vic can’t see the anti-woman, anti-lgbtq, etc., biases in their policy. There’s no single reason, of course, but I think the “guys talking to guys who talk about guys” phenomenon has a lot to do with it. Robert’s circle of Tech Bloggers and Journalists is over 80% male — just like his “Tech Leaders and Influencers” Facebook group. So is it any surprise that he reacts to Google’s unfair suspension of Skud’s and Identity Woman’s account with a shrug? And he, Joseph, and Vic are buddies from way back; so of course they listen to his feedback. Yeah, a lot of people are upset about the policy, a lot of their most passionate early users are leaving or have had their accounts suspended, but Robert’s reassuring them that most people are like him and prefer that Google check people’s IDs rather then let anybody use the same name they do on Twitter or with their friends. Strangely enough though most of the women I talk to feel differently. The people who do join Google+ will predominantly be privileged white and male. This will skew the pool of opinion here in favour of people who are privileged, white and male. Such a skewed environment will be familiar and comfortable to people who live in cultures which are, for similar reasons, skewed in similar ways. That there are few people here who are not imbued with the privileged white male worldview will make for a peaceful and agreeable place, where biases are shared and reinforced by “people like us”. The social tropes and cultural shaping that emerges from such environments is biased in favour of privileged white males, and the people who reside in this culture will see it as right and natural. Here’s what I get. On the left is the search using Firefox, not logged into G+. On the right is the search from Chrome, logged into G+ as Jon. Other than Stephen Van Der Berg’s post, which goes from #5 to #3, the top ten results are identical. The number of hits is about 15% more when logged into Google+ but it might just be coincidence.